Barcelona, in my humble opinion, is one of the liveliest cities in Europe. I remember one of my first trips there, I arrived on a Sunday evening. 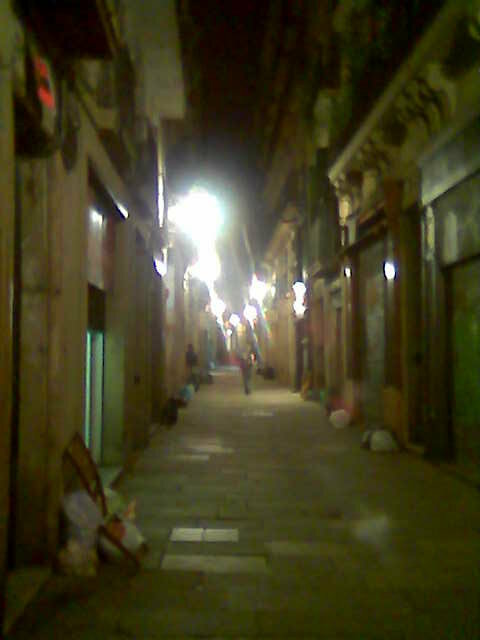 After checking into my hotel in the old town (Barrio Gotico) at 11 p.m., I needed to get out and get some fresh air. So a walked the two blocks to the main promenade, Las Ramblas, and was amazed to see it full of life: the magazine- and pet-shop kiosks were open, the broad pedestrian zone was full of strolling people. Where almost any other city would be sleeping, Barcelona was still going full blast. I walked down to the redeveloped harbor, Port Vell, and one club after the other was shaking to dance music of every possible style, and they were filled to bursting with dancing couples. What a place! This running route is fairly obvious, encompassing what most tourists view on their first day, anyway. But if you're working in Barcelona, you don't spend your days doing the tourist stuff, do you? So, to make up for that dreadful oversight of fate, we'll do a round through all the great stuff now. This will first look at the most amazing houses designed by genius architect, Antoni Gaudi, loop through Las Ramblas to the harbor, visit the beach at Barceloneta, then head back through the maze of medieval alleyways in the Barrio Gotico. We'll start running at the heart of Barcelona, in its huge Plaza de Catalunya. All the Metro lines and buses converge here. We'll first take a little detour, leaving the Plaza on the northwest corner, near the El Corte Ingles department store, heading northwest, up the elegant Passeig de Gracia. This is Barcelona's grandest avenue, full of stately old buildings. 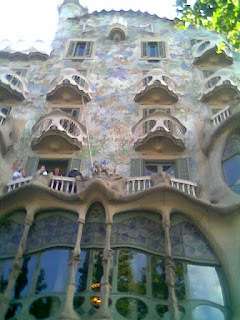 Gaudi designed a couple of incredible buildings on this street, and also the amazing street lamps and mosaic benches. Run 4 blocks on the left-side of the street, past the Borsa (stock exchange) until you're just at the crossing for Carrer d'Arago. 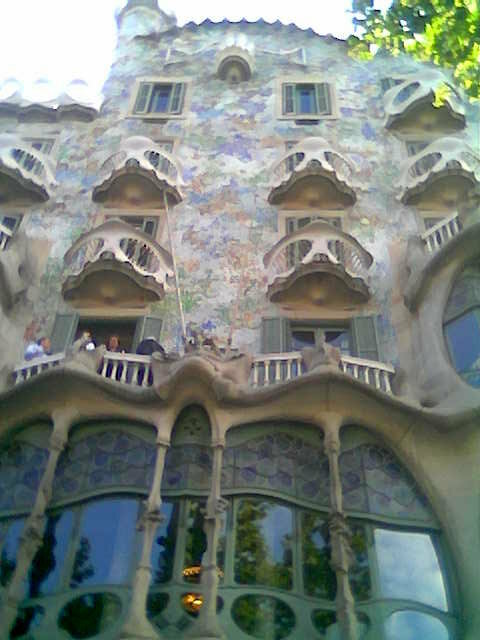 There, you'll probably see a crowd of people staring up at the bizarre house, Gaudi's Casa Batilo. The gothic-styled neighboring house is really cool, too. So now that you've seen it, off we go, running back the same way to the Plaza Catalunya again (hey can't this guy figure out a less repetitive route? 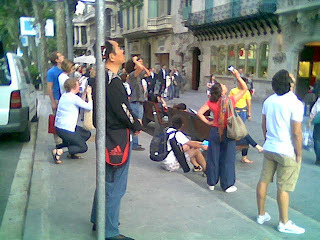 ), cutting through the plaza to the southwest corner, where Las Ramblas starts. There will be, unfortunately, hordes of tourists, and accompanying hordes of street hustlers trying to syphen off some of their money. It's kind of hard jogging through the crowds, but just relax and walk when your way is blocked. 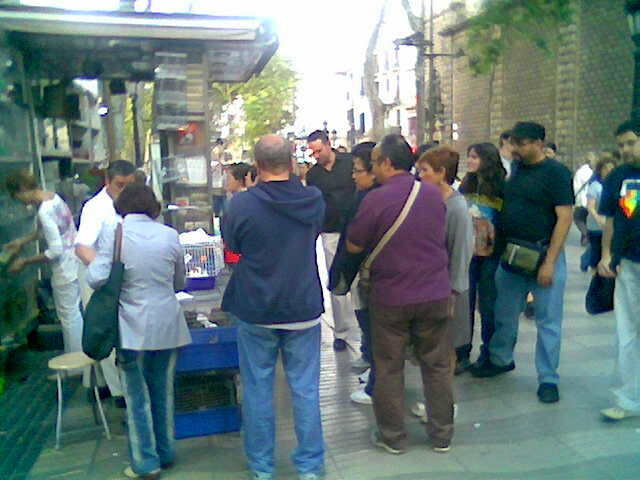 Enjoy the streetlife, the kiosks, the street performers. After a few blocks, you will see the old market, Mercado de San Jose, on your right. Try looping through it if it's still open, and enjoy the old-time market atmosphere: like butchers with bloody cows heads, the blood running down into the stone gutters. Las Ramblas ends down near the old harbor, at the big column crowned by the Christopher Columbus statue. Keep going straight past the traffic circle, across the main street, and you'll see the modern pedestrian bridge going out to Port Vell, the modern harbor development, with its restaurants, cinemas, aquarium and marinas. After getting to the modern port buildings, do a loop around the buildings towards the left side and exit at the north end, after passing the replica of the wooden submarine. At this point, you could shorten the run, and head back through the Barrio Gotico. Or, if you're in great shape and you're feeling adventurous, do the next loop, following the water, keeping it to your right side, by running by the old warehouses now converted into a restaurant mile, full of outdoor seating. The marina will be on your right, and a park on your left. Cut through the park to Barceloneta. This neighborhood was designed as working-class apartments for the harbor workers, with long, narrow, one-way streets leading out to a great beach. Everything here is down-to-earth, with wash hanging from the balconies and the streets are a bit dark. The neighborhood is harmless, though. I like going into the side-streets and, turning right, following them to the beach. 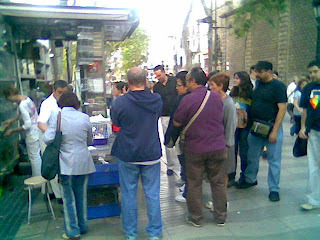 But if you want to avoid the alleys, just go up the main street next to the park, the Passeig de Joan de Borbo, full of restaurants and people. 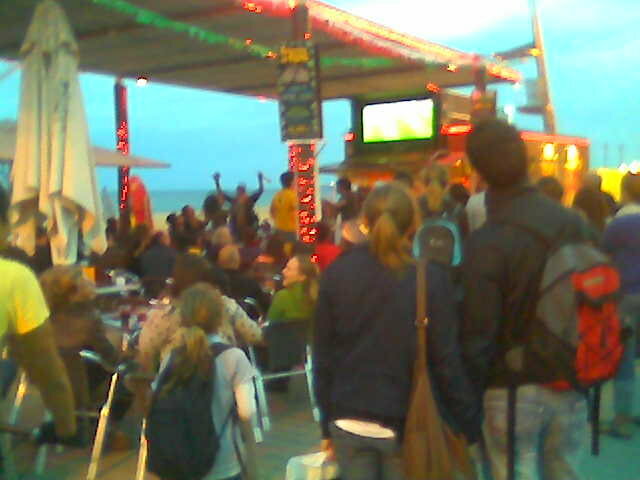 Barceloneta beach bar during the World Cup: Brazil just scored! Once at the beach, I normally kick off my shoes and jump in for a swim. Then I loop back through the neighborhood, landing back at the converted warehouses with their restaurants and the Museum of History. This is a major intersection, with the Ronda de Litoral coming together with the Passeig de Colom. 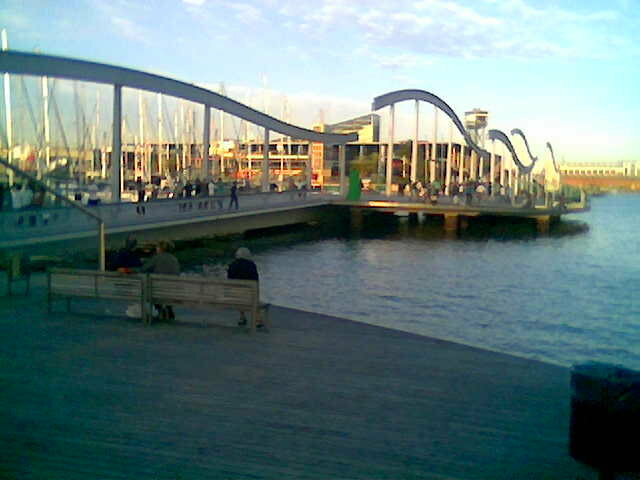 We now have the Port Vell marina to the left, and the old town, the Barrio Gotico straight ahead. It's difficult to guide you through the old town, because it is really a maze of alleyways, curving and branching at every turn. And most of the streets are VERY lonely. If you don't want to take any risks, just run up the Via Laietana from the main intersection. This street cuts straight through the old town, and is full of people and traffic, but lacks character. One of the smaller alleys in the Barrio Gotico: a bit eerie! I would recommend crossing the Passeig de Colom and then head left until the first real side-street to the right, the Carrer de Regomir. This street also cuts through the old town, but curves a bit, going through the Plaza de Sant Jaume, where the town hall is. Then, under the name Carrer de Bisbe, it goes by some of the old Roman remains and the great old cathedral. You'll find yourself running out through the old Roman city gates to the cathedral plaza. You feel as if you just passed through about 10 centuries of human culture. Now you just keep going straight the last few blocks to the Plaza Catalunya, on the street called Avenguda del Portal l'Angel.